You hear me talk about eating clean and avoiding processed foods, foods altered by people but then I go and make a recipe with milk… so what gives? I’m going to break down the reality of processed foods and how it relates to a clean eating lifestyle. Processed foods have been altered from their natural state for safety reasons and for convenience. The methods used for processing foods include canning, freezing, refrigeration, dehydration and aseptic processing. We tend to think of processed foods as bad, but it turns out that many processed foods are not unhealthy. For example, milk would be considered a processed food because it is pasteurized to kill bacteria and homogenized to keep fats from separating. While some people prefer to drink raw milk, most of us should consume the “processed” version we find in our grocery stores. Another healthy example of food processing is frozen vegetables. While fresh may be best, freezing vegetables preserves vitamins and minerals and makes them convenient to cook and eat all year around. Fruit and vegetable juice is also an example of a healthy processed food. In fact, some orange juice is fortified with calcium to make it even more nutritious. Of course, there are a lot of processed foods that aren’t good for you. Many processed foods are made with trans fats, saturated fats, and large amounts of sodium and sugar. These types of foods should be avoided, or at least eaten sparingly. These processed foods and prepackaged meals are very convenient and popular. If you do shop for these foods, be sure to look for products that are made with whole grains, low in sodium and calories, and free of trans fats. Make sure you pay attention to serving size, too, and balance out the processed foods you eat with a delicious fresh salad and some whole grain bread. You are what you eat, even when you don’t know you are eating it! 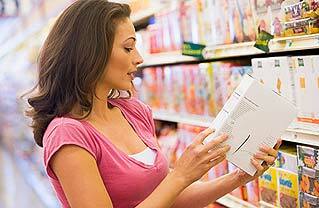 Your food label needs to become your roadmap for grocery shopping. After a few trips, a little practice and some helpful tips you’ll be well on your way to knowing what to avoid! Here is a list of some of the most harmful and common additives that are in the average American’s diet. Natural Flavors are naturally occuring substances approved for use by the FDA. These substances could contain flavors that come from allergy causing ingredients like nuts and wheat. If you are prone to food allergies this could be a big problem for you. These are fertilizers, insecticides, and herbicides that farmers spray their plants with the repel insects and weeds. Unfortunately they are not required to be listed on the ingredients of food. More often than not the residue from these chemicals remain on your food. Studies have linked these chemicals to cancer. You can avoid these toxins by washing your food with 1tsp of dish washing detergent with 4 liters of water or you can shop organic and avoid these chemicals all together. Sodium Nitrite is a preservative that is found in processed meats such as Bacon, lunch meats, and other processed meats. The problem with Sodium Nitrate is that it can mix with other chemicals in the stomach to form nitrosamines. Nitrosamines have been linked to various types of cancer. You can avoid this by avoiding canned soups, frozen dinners, and buying fresh meats and nitrate free lunch meat. This ingredient is listed as High Fructose Corn Syrup, Corn Sweetener, Corn Syrup, or Corn Syrup Solids. It is found in frozen foods, sweets, breads, sauces, sodas, candy, ketchup, and countless other foods in the American diet. HFCS is the grim reaper when it comes to your health. It brings with it a truckload of health problems including increasing your risk of diabetes , heart disease, and high cholesterol. It also can increase insulin resistance which can lead to obesity and a plethora of additional health problems. In fact High Fructose Corn Syrup tricks your brain into thinking it’s still hungry so it actually encourages over eating! Unlike other natural sources of Fructose like fruit HFCS has no additional vitamins or minerals. It has zero nutritional value. You should try to avoid foods that contain HFCS at all cost. You can find these ingredients under the names red #3, green #3, blue #2, and the list goes on. They are find in Candy, sodas, and other foods that seem to be unnaturally brightly colored. Studies have linked artificial food colorings to a host of health problems including cancer and thyroid problems. You should steer clear of artificially colored foods. This additive is found in dairy products. rBGH is a growth hormone that is injected into cows to stimulate milk productions. After approving the use of rBGH in 1993, the FDA has turned a deaf ear to the pleas of consumers, food safety organizations and scientists to reverse its approval of the hormone, or to simply require labeling of foods containing rBGH. The milk in grocery stores often contains this hormone. rBGH has been tied to prostate, colon, and breast cancer. You should look for milk that does not contain rBGH or switch to organic milk. This often appears on labels as Linoleic acid, sunflower, sesame, corn, and soybean oil. Many frozen and processed foods contain these oils. This oil is not harmful in small amounts, but unfortunately Americans consume on average 5 times to much of these acids. This excess intake can cause high Blood Pressure and heart disease. You can avoid this excess intake by avoiding processed foods and substituting Omega-6 intake with OMega-3 from foods like almonds and fish. This can be found on food labels as Monosodium Glutamate, baking soda, or salt. It is found in almost every food we eat, but processed foods and meats contain large amounts of salt. Unfortunately most restaurants often use Sodium in excess to season their foods. Excess Sodium can cause High Blood Pressure and put undue strain on your heart. You can avoid high salt intake by cooking at home and using herbs instead of salt. This might disguise itself as yeast extract, gelatin, textured proteins, sodium casseinate, and many other names. This is found in many frozen foods, chips, and fast food. It has been shown to trigger migraines and make you feel hungrier than you are. You should carefully read packages to make sure there is no MSG in them. Usually this additive is listed under the name partially hydrogenated oil. It is found in many baked goods we find on our shelves. It is also in margarine. Even though a food claims to have 0 trans fats that might not be true because a company is not required to list the trans fat content if it contains under .5 grams. So you must read the ingredient list on the label. Read a few labels on your next shopping trip and look for fewer ingredients and ones with names you can pronounce! The more wholesome the better!